Huawei P8 blueprint reveals super-slim design, fingerprint scanner? In a little over 20 days from now, on April 15th, Huawei is set to hold an event in London – one that is expected to finally bring an end to the steadily increasing stream of Huawei P8 rumors, and show us the real thing. With the unveiling closing in on us, it's not surprising to see the rumor mill churn out more and more relevant leaks, and today we mark another one – a supposed blueprint of the P8. 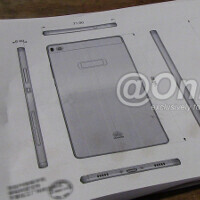 The drawings, if legit, give us quite a bit of insight into Huawei's upcoming flagship device. For starters, they confirm that the latest slew of design images that have cropped up all over the internet are seemingly authentic – the bottom side, especially, is identical to what we've already seen. But that's hardly all that can be gleaned from the blueprints. Indeed, we now finally have an exact measurement for the P8's body – 5.7 x 2.83 x 0.26 in (144.9 x 71.9 x 6.6 mm) versus 5.50 x 2.71 x 0.26 in (139.8 x 68.8 x 6.5 mm) for its predecessor, the 5-inch Huawei Ascend P7. This makes the P8 taller, wider, and even slightly fatter, despite previous rumors suggesting that it'll come in an even slimmer body. The growth in size seems to be in agreement with another sliver of intel – the new flagship will have a larger, 5.2-inch display. Another point of interest is the rectangular cut-out on the back of the P8. Obviously, our first guess is that Huawei has a fingerprint scanner on its mind – the Ascend Mate7 has a truly excellent one – but its peculiar shape has us uncertain. According to the source, the space could be used as some sort of touch pad, though that's obviously just speculation. So far, the specs breakdown looks like this: a 5.2-inch, 1080 x 1920 pixel resolution display, an octa-core Kirin 930 processor coupled with 3GB of RAM, a 13MP/8MP camera combo, and a 2,600 mAh battery that might hold a surprise. Official Huawei P8 teaser suggest great battery life... or solar charging? Sony + apple design = huawei p8. Those measurements have got to be off. A 5.2" 1080p display is only 2.55" across and that phone has just about no bezel. No way it's 2.83" wide. I'd guess no more than 2.65" Those bezels are just about non existent. So either the dimensions are off or the screen is closer to 5.5". Glad you noticed that, but we will see what happens in April. Still do not believe the battery is 2600mAh. huawei is capable hardware company, their hardware is good and kirin processor is pretty decent if not for mediocre GPU. Is that an Xperia Z3?? !